Local community radio station RTRFM has launched its annual Radiothon, the yearly appeal for subscribers which keeps the station operating for another twelve months. The annual subscriber drive returns from August 10 – 19. 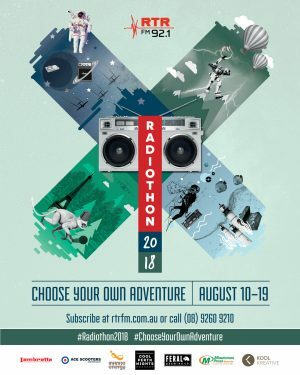 This year RTRFM’s presenters, volunteers and staff are calling on their listeners and supporters to ‘Choose Your Own Adventure’. “When you chose to support RTRFM, you choose the best music, the most important conversations, and choose the station that puts arts and culture front and centre in Western Australia.” the station said in it’s announcement. 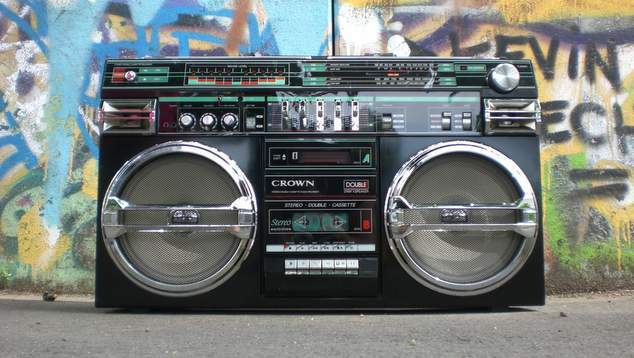 RTRFM is a not-for-profit independent radio station that survives only through the support of our listeners by way of subscriptions and donations. The money raised from their annual Radiothon makes up more than a third of RTRFM’s operating income and enables them to continue producing high-quality music & talks programming year-round. The adventure begins at 6am, Friday August 10 on Breakfast with Caitlin, Later in the morning listeners can join the celebrations in person as RTRFM broadcast a special edition of Artbeat from 9am from the Mary Street Piazza. The Mary Street Bakery will also be revealing their special Radiothon donut! The annual Radiothon opening party will be held on Saturday August 11 as RTRFM take over three stages at Badlands Bar in East Perth. Local musicians New Talk, Heebeejeebies, Montana Wildhack, Dumbleachers, Noah Dillon, Skullcave, Filthgodess, Black Stone From The Sun, Ratking, Yomi Ship and Double Think Prism will be playing. Plus station DJ’s Libby Noble, Casey Mclean, Jess Warriner, and Kailyn Crabbe will keep the vibes high and get you dancing long into the night. If guitars aren’t you’re thing, then head to the closing party at two of Perth’s finest small bars for an intimate Radiothon closing party. The Bird and Ezra Pound will host the closing party on Saturday August 18th. At The Bird you can catch the live electronic sets and deep vibes from Elsewhere/ Rebecca, Bahasa Malay, Jamilla and Guy Contact alongside DJ Darcy Love. Down the ally way to Ezra Pound we dance the night away with some of Perth’s DJ heavy weights. From 5pm catch Jonny ‘Fandango’ Hopper, before Claude Mono and Diger Rokwell take over the reins. From 7pm the party starts as DJ Girlname & Benj Ramsey kick things off. Intern Hookup, Jack Dutrac and Allstate will bring things home, closing out Radiothon 2018. Radiothon lasts for 10 days, finishing on Sunday, August 19 after the conclusion of popular program Sunday Morning Coming Down at 12 noon. Throughout the 10-day Radiothon extravaganza, the RTRFM studios will be inundated with special guests– from appearances of former presenters and visits from local personalities to live in-studio performances from our favorite musicians. the station promises that everyday of Radiothon will be an adventure. RTRFM’s dedicated team of phone room volunteers will be on standby to take your subscriptions and donations throughout the Radiothon period, and listeners can also subscribe online at rtrfm.com.au. Everyone that subscribes to RTRFM during Radiothon 2018 goes in the running to take home one of our amazing major prizes. This year’s major prize is a hot new Lambretta V-Special scooter thanks to Lambretta & Ace Scooters, this scooter will be launched in Australia in August but RTRFM have the only bright orange one in Australia. OUTinPerth co-owner Graeme Watson is a presenter at RTRFM, and a former employee of the station.